In this jazz guitar lesson, you will learn the most common chord progressions used when playing a minor blues. Comping over a minor blues tune is an essential skill for any jazz guitarist, as minor blues tunes are some of the most commonly called songs on jam sessions. While it’s an important form to have under your fingers, many guitarists spend the majority of their practicing on the major blues form and less on minor blues. These progressions will start off rather simply, with what is referred to as the basic minor blues, and will consequently get more and more complex until reaching a point of chordal saturation. Each progression in the lesson has a backing track that you can listen to, jam along with, and use as a practice aid. The first example lays out the chords to what is considered the most common minor blues progression. These are the changes that one would play if a minor blues were called at a jam session, or if they were playing with a band for the first time. In the next progression, we will insert a common substitution over the II chord in bars 9 and 12. Instead of playing the Dm7b5 chord each time the II chord comes around, we will play its tritone substitution (Ab7) instead. The Ab7 chord resolves smoothly down by a half-step to the G7alt chord that follows it each time it is played. This progression is often intertwined with example 1 without much distinction between the two. Since Ab7 and Dm7b5 are so closely related the only real audible difference between these two progressions is the bass movement in bars 9-10 and 12. In the following example, we will insert our first secondary dominant chords. A secondary dominant chord is the dominant chord (V) of a diatonic chord other than the I. The dominant chord (V) in the key of C minor is G7, which is the dominant of Cm7. An example of a secondary dominant chord is C7, the dominant (V) of the Fm7 in bar 5. The two added chords in bar four (Gm7b5-C7) are a ii-V7 progression in the key of F minor. These chords allow for a smooth transition between the I chord (Cm7) and the IV chord (Fm7), by temporarily cadencing in that key. In this example, we will add a turnaround progression in the second bar. A turnaround is a series of chords that takes the listener from one chord (Cm7 in this case), and turning it around back to itself using a series of chords (Dm7b5-G7alt in this case). These chords help to add harmonic diversity to the first three bars of the minor blues, which is normally just a long Cm7 chord. They allow you as an improviser or comper to have more movement with your lines/chords, while not stepping too far away from the tonic key. Now we will add a bIIImaj7 chord in between the I and II chords in bars 1 and 12. The Ebmaj7 chord is the relative major of C minor and allows for a smooth connection of the I and II chords. These four chords (Im7-bIIImaj7-IIm7b5-V7), are one of the most common minor key turnarounds found within the jazz idiom. Now that we have focused our turnaround substitutions on the tonic key, we can start to turnaround to secondary keys/chords. In this example, the target chord of the new turnaround is the Ab7 chord found in bar nine. The previous two bars (Cm7-F7/Bbm7-Eb7) act as a iii-VI/ii-V progression that resolves when it reaches the Ab7 chord in bar nine. So without stepping outside of the main chords in our original progression, we are now able to create movement in almost every bar of the progression, simply by inserting turnarounds. Now that we have used as many turnarounds as we can, we will start to alter these turnarounds to give ourselves several options when playing through the progression. We will start by adding tritone substitutions into the tonic turnarounds in bars 1-3 and 11-12. Since the Ebmaj7 is already a fifth away from Ab7, we can simply make it a dominant chord (Eb7), which will now start a series of three dominant chords that move through the cycle of fourths before resolving by a half-step to the Cm7 chords in bars 3 and 1. In bar four the C7alt is subbed by a Gb7 chord, which resolves down by half-step to the Fm7 chord in bar five. In bar seven the F7 chord is subbed by its tritone to become B7. The Eb7 chord in bar eight is replaced by an A7 chord. The use of the tritone subs can sometimes become monotonous because of the continuous half-step movement occurring during each cadence. In order to avoid this, you can alternate between using the standard turnarounds and the tritone turnarounds. We can now add tritone subs to the ii chords of each of the turnarounds, which produce cycle progressions. A cycle progression is a chord progression where the roots of each chord moves by a fourth to the next chord, for example the Eb7-Ab7-Db7 chords in bars one and two. The cycle progression in bars seven and eight starts on an F#7 chord, then moves through B7-E7-A7 before resolving by a half-step to the Ab7 chord in bar nine. In the last two bars, the tonic chord (Cm7) is replaced by a Bb7 which allows for a four chord cycle progression (Bb7-Eb7-Ab7-Db7) to occur. Since the last two bars will resolve to the tonic chord in bar one, it is not always necessary to state the tonic chord (Cm7) in bar 11 of the progression, since it will be stated two bars later when the progression resets itself. In the next example, we will stretch out our cycle progression so that it stretches the length of the first four bars before it resolves into the Fm7 chord in bar five. All eight chords move by a fourth to the next chord before the Gb7 chord resolves down by a half-step to the Fm7 chord. This progression can be heard in the playing of McCoy Tyner and other hard bop players of that era. Since the first chord of the progression is now a G7 chord, the last two bars must be altered to cadence into the new key. And resolves by half-step back to the top of the form. In this last progression, every chord found with the cycle progression in the first four bars of the previous example is replaced by its tritone sub. So the progression now begins on Db7 and moves by fourths until it resolves from the C7alt to the Fm7 chord in bar five. As well, a Cm7 chord has been added to the beginning of bar seven to remind the listener of the tonic key, since the first four bars do not contain this chord anymore. Also notice how smoothly the Cm7 chord moves down in the B7 chord in the second half of bar seven, before moving by fourths and resolving by a half-step to the Ab7 in bar nine. To help you take some of these changes to the fretboard, here is a two-chorus comping study that you can learn and use in your practice routine. Without writing 11 choruses (one for each variation in this lesson), the study below uses the basic minor blues changes for the first 12 bars, followed by variation 7 in the second 12 bars. This will give you an idea of how it feels and sounds to mix a number of chord substitutions along with the basic changes, hearing the difference along the way. In this section, you will work on a minor blues in A minor with the iiim7-VI7/iim7-V7 substitution introduced in variation 6 above. Before you dive into the chord study as a whole, here are a few important concepts that are used in the study. If you dig these sounds, you can take them to other keys, other progressions, and other tunes as you apply them to other musical situations. Contrary to traditional chords, which are built in stacked 3rds, quartal chords are built by stacking 4th intervals up from the root note. Notice that the intervals are all different in the drop 2 chord, which comes from a stacked 3rd foundation. In quartal chords all of the intervals are symmetrical. This gives it a more ambiguous sound that many jazz pianists and guitarists like to use in their playing. These chords are built using three-note shapes (triads), but are used in a non-traditional sense to “jazz” them up a bit. Rather than playing the triads from the root of any given chord, you’re playing them from the 3rd, which highlights the 3-5-7 intervals of that chord. You can see this technique in action with the Am7 chord below. In the first chord, you are playing a drop 3 root-position shape. In the second chord, you are removing the root, leaving a C major triad (the 3-5-7 of Am7). you can simply remove the root of the underlying 1-3-5-7 chord. Or you can learn the triads for each chord shape. 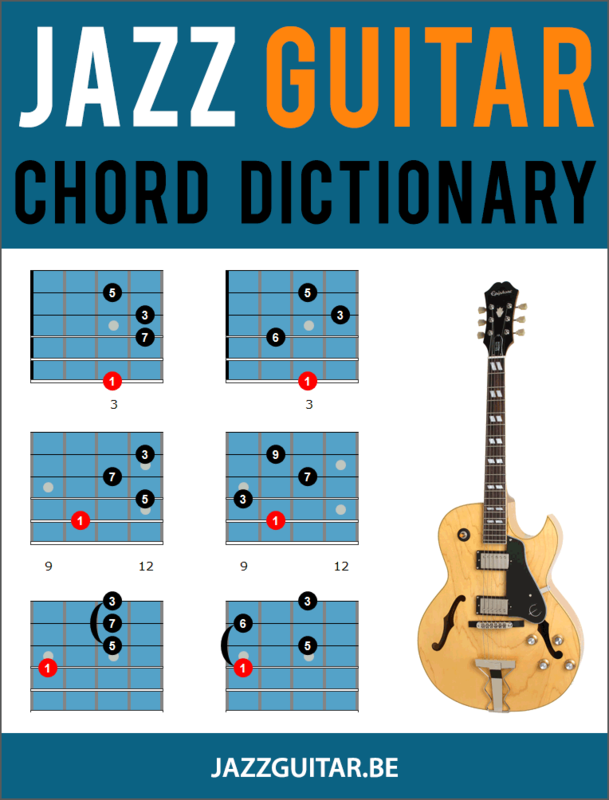 Drop 2 chords are some of the most popular shapes in jazz guitar and are found in the playing of just about every great jazz guitarist. These shapes are built from a 1-5-7-3 root-position shape, with inversions constructed out from there. You can see the drop 2 shapes over both Am7 and F7 in the examples below. Notice that they don’t have any string skips in them (as drop 3 chords do), which allows you to strum them with ease and not worry about open strings ringing out. Now that you’ve looked at what’s behind the chords in this solo, you’re ready to learn the solo itself as you dive into this minor blues chord study. Take each four-bar phrase at a time at first. Then, when you’re ready, put it all together. Start slow and play it along to the sample audio file below, before playing it over the backing track when comfortable. Have fun with this chord study, and make sure to take these shapes, rhythms, and phrases into your other comping ideas of minor blues, and other minor jazz tunes. Hi Matt, this is a very interesting elaboration of minor blues. Could you please explain the meaning of the f# note and the Bm triad on Am7 on bar 2 and 3. Is it because you are thinking of A dorian mode? Thanks for your wonderful work and sharing. As much as I’d like to devote more time to jazz, I am in a couple of pop/rock bands (in my late 50’s) and trying to infuse jazz techniques(big fan of Larry Carlton and Robben Ford) into songs like Thrill is Gone, While My Guitar Weeps, etc. Any further suggestions would be much appreciated. Thank you for all the material you post! Thank you so much for this wonderful resource. I’m much less a guitar player than composer/arranger, and this series of progressions is a rich, rich resource for my purposes.